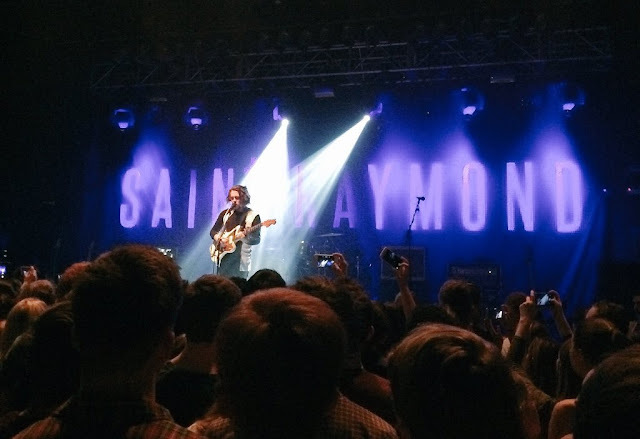 Saint Raymond (20 year old Callum Burrows) is extensively touring his 17 track debut album "Young Blood" all across the UK through November and December this year, and It's All Indie were lucky enough to catch the opening night at Bristol's O2 Academy. "Young Blood" has some fantastically catchy songs which, when backed by a full band, become much bigger and beefier than on record. As on the album, Saint Raymond opened with mega-anthem "Letting Go" allowing the crowd to warm their vocal chords too thanks to the momentous backing vocal chants throughout the chorus. In truth, this was a pretty full on hour and a quarter, with other standout tracks being radio-friendly singles "I Want You" and "Wild Heart", although there was a perfect mid-set chill out to "As We Are Now" where Saint Raymond's band left him to perform solo. Closing with title track "Young Blood" and a perfect indie-rock cover of Major Lazer's "Lean On", it seemed as if the first night could not have gone better for Saint Raymond, and that anyone else checking out the tour is in for a big treat.